[In the construction of an assemblage of outside & subterranean poetry the question looms of whether to include in the composition some of those who in the aftermath of their lives were celebrated & canonized as ultimate & necessary insiders. For Dante the outsidering came in his 37th year, when he was banished from Florence into what came to be a lifetime of exile from his native city. That the Commedia emerges from this is a point to be considered, the Inferno in particular an image of a world peopled at times with those similarly exiled or outsidered. 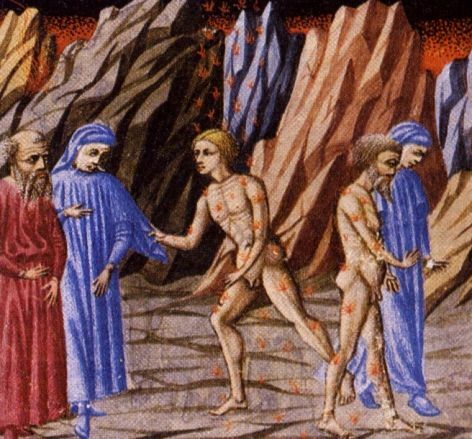 Of the heroic damned, as Dante imagines them, Brunetto Latini, who was Dante’s guardian & teacher, stands out with his stride, curiously triumphant, as he runs off into the distance more like “one who wins, not one who loses.” The spirits of the ancient poets in Limbo (Canto 4) are yet another nod to the subterranean & outsidered nature of what was clearly dear to him. and screens water and embankments from the fire. had made them neither as high, nor as wide. I couldn’t have made it out. like an old tailor into his needle’s eye. at him for a hundred years. as in a reverential stance. but just yesterday I turned my back on it. will fall on you for your good works. Rid yourself of their usages; be sure to do it. but the grass will forever elude those goats. What I owe you my tongue will declare all my life. I am prepared for Fortune; whatever happens. “Some deserve words; others silence. There wouldn’t be enough time for such talk. Were polluted with the same sin. —the Servant’s Servant!—and died unnatural. and new people approach, not my shades. To your care I commend my Treasure. the one who wins, not the one who loses.